Test pressing of the 12" version of the Overkill single, one-sided (side 2 plays just a constant tone). First time I heard of this was on Ebay in July 2014 which means it is not listed in Stevensons Collectors Guide (2011). This copy was housed in a white cardboard sleeve with a date stamp in the top left corner, "22 MAR 1979" and below it has hand writing "12 BRO 67 A-1U, G O ER" in black and then with a blue pen "Motorhead 12", 12 BRO 67 A-1, Received 22/3/79, Approved 23/3/79. In the lower right corner the sleeve has "WLPC 101" printed. 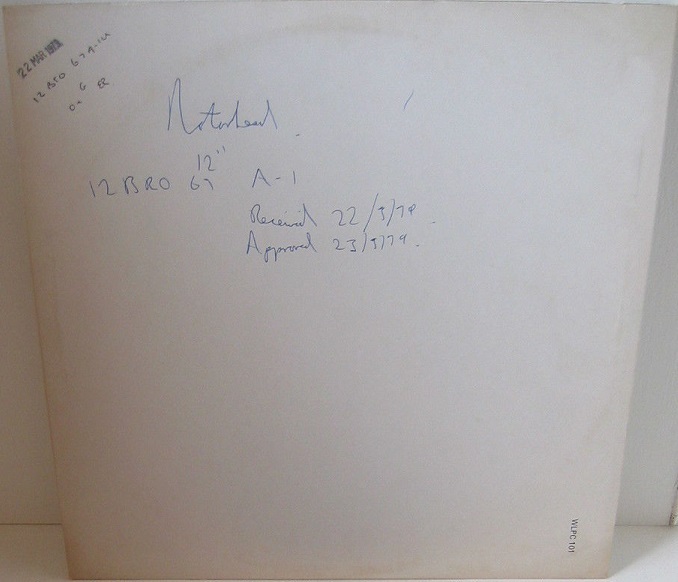 The record is housed in an inner sleeve, labels are completely white with no hand writing. It was sold by echo2ndhand, located in Loncoln, United Kingdom.